The U.S. Congress is the Legislative Branch of the federal government. It has two bodies. The Senate has two elected officials from each state. The House of Representatives' membership is based on each state's population. These two houses provide a check and balance. The Senate makes sure each state has equal representation. The House of Representatives allows states with more people to have a bigger voice. Since the First Congress, which met from 1789 to 1791, all Congresses have been numbered in order. The session usually lasts from January 3rd to July 31st, but in special cases, it can last longer. Every other November, voters elect all 435 Representatives and a third of the Senators. The newly-elected Congressmen don't take office until January. The time between those two dates is known as the Lame Duck Session. The members who weren't re-elected have less political power. As they're leaving in a few weeks, often nothing gets done. Congress has five support services. The Government Printing Office prepares all public documents. The Library of Congress catalogs them. The Architect of the Capitol maintains the building that houses Congress. The Congressional Budget Office analyzes the president's annual budget. It also reviews large programs. These include Social Security, the Department of Defense, and even the Navy's Shipbuilding Plan. 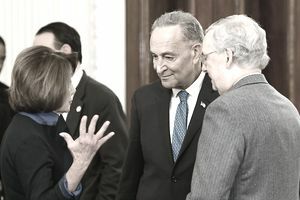 The CBO played a critical role in resolving the 2008 financial crisis by analyzing the Troubled Asset Relief Program and the American Recovery and Reinvestment Act. These programs may never have gotten off the ground without CBO's respected analysis. The CBO employs about 230 people, primarily economists, and public policy analysts. The General Accounting Office advises Congress on wasteful government spending. That includes duplication and areas that could be more efficient. For example, the country may no longer need the Strategic Petroleum Reserve, thanks to shale oil production. The GAO also identifies outright high-risk agencies and programs. For example, the Department of Veterans Affairs expanded rapidly. That could create inefficiencies and duplication. The Joint Economic Committee is a permanent committee with 10 Senators and 10 Representatives. It advises Congress on the economy. It holds hearings to educate members on economic issues. The U.S. Constitution grants Congress the unique power to create laws. Each house can write, debate, and pass bills. But it doesn't become law until both houses agree on the final wording, and it is signed by the president. If the president doesn't sign the bill, there are still two ways it could become law. If the president vetoes the bill, it returns to Congress. Congress can override the veto if both houses pass the bill with a two-thirds majority. If the president takes no action, that's a pocket veto. But Congress can override a pocket veto by staying in session for 10 days. There are two types of bills. Public bills deal with general questions. They become Public Laws or Acts if approved by Congress and signed by the president. An example is the Affordable Care Act. Private bills deal with individual matters. These include claims against the federal government, immigration and naturalization cases, and land titles. These bills become private laws if approved and signed. Congress uses this its power to enact laws to create the federal budget. The president kicks off each year's budget process by submitting a proposal to Congress. It reflects the president's priorities, estimates, and departmental requests. Congress then determines the discretionary spending for each department through appropriation bills. It can use the president's budget as a guide. Like any other bill, the House and the Senate create separate budgets, then reconcile them before submitting to the president for signature. Congress also sets the debt ceiling. It limits how much outstanding debt the United States can owe. On February 9, 2018, President Trump signed a bill suspending the debt ceiling until March 1, 2019. As a result, the limit will be whatever level the debt is on that day. Congress frames foreign policy and trade. It gives the president trade promotion authority to negotiate trade agreements. It then votes yes or no on these agreements. These include the North American Free Trade Agreement, the Trans-Pacific Partnership, and the Transatlantic Trade Investment Partnership. It also votes on regional and bilateral agreements. Only Congress has the power to declare war, but it hasn't done so since World War II. The president can engage in military action under three other circumstances. As part of a United Nations’ action. Under a joint congressional resolution authorizing military force. Using the War Powers Resolution of 1973. Congress hesitates to declare a state of war because it confers special powers on the president. These include the right to take over businesses and to conduct spying without a warrant. Congress supervises both the executive and judicial branches. The House can impeach a president. The Senate approves presidential appointments, treaties, and votes on House-sponsored impeachments. It establishes the federal courts and their jurisdictions. Congress regulates interstate commerce. It establishes immigration rules. It also holds hearings on critical national issues. Congress' power to create laws and set the budget means it has the power to set fiscal policy. When spending increases or taxes are cut, that's expansionary fiscal policy. It increases economic growth. Contractionary fiscal policy is the opposite. For example, in 2000, Congress passed the Bush tax cuts. They were due to expire in December 2012. Members disagreed on whether it should expire. That led to the fiscal cliff in 2012. If Congress doesn't approve a budget, the government shuts down. That occurred in 2013 and 1995. If Congress doesn't raise the debt ceiling, the United States must default on its debt payments. Congress delayed raising it in 2011, setting off a crisis. Standard & Poor's lowered its outlook on U.S. debt, sending the Dow down 200 points. The U.S. debt crisis is an ongoing series of events. It's caused by the opposing strategies Democrats and Republicans in Congress have for reducing the U.S. debt. Individual Congressmen affect the economy. For example, former U.S. Representative Barney Frank was chair of the House Financial Services Committee. He investigated the banking practices that led to the 2008 financial crisis. He co-sponsored the Dodd-Frank Wall Street Reform Act. Congress constantly adds new laws that affect you in all kinds of ways. Since the First Congress, which met from 1789 to 1791, all Congresses have been numbered in order. The session lasts from January 3 to July 31. In special cases, it can last longer.